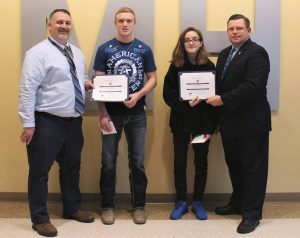 The Knights of Columbus John Marshall High School Students of the Month for December are Zoe Johnson and Noah Beckett. Zoe Johnson is confident that her efforts in the classroom allowed her to earn this award. “I feel as if the teachers saw me as a student who got relatively good grades and did exceptional work in their classes.” said Johnson. JMHS Assistant Principal Geno Polsinelli believes Zoe’s character is admirable and deserves recognition. “She is a good student recognized by her teachers. She also has a good support system at home, and she’s a role model to the other students here at John Marshall,” Polsinelli said. Noah Beckett believes his dedication to the classroom is why he earned this award. “I work very hard in and out of class, homework, tests and studying. I feel the teachers saw that I do good work,” explained Beckett. Polsinelli considers Noah a remarkable student. “He is a student athlete who is also recognized for his exceptional abilities in the classroom. He uses those abilities on the playing field as well,” said Polsinelli. Beckett plays football and baseball.